It may surprise you to learn that a large number of forklift truck accidents occur across the country on a very regular basis. The purpose of a seatbelt differs widely between a car and a forklift truck. In a car, a seatbelt is designed to protect and restrain the driver and passengers in the event of a high speed collision. This prevents the driver and passengers from colliding or impacting with the interior of the car. People often wonder why forklift trucks have seatbelts as they travel at a much slower pace. It may seem strange therefore that seatbelts on forklift trucks are not designed to protect the driver in the event of a collision. Instead these seatbelts are designed to stop the driver from succumbing to the fatal urge to jump when a forklift truck overturns. 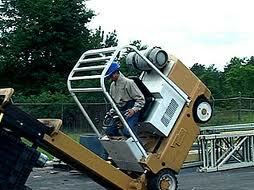 In many cases the process where a forklift truck begins to topple or overturn begins slowly, due to this a number of drivers have in the past felt the urge to jump free. 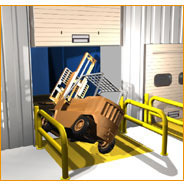 This can be a fatal exercise, this is because if an operator begins to slip in their seat or is tempted to jump free as the forklift begins to topple they run the risk of having being trapped or crushed between the truck’s overhead guard and the floor. The seatbelt in a forklift truck is designed to keep the driver in the relative safety of their seat in the cabin. Unfortunately, it is becoming increasingly common for Coroner’s Inquests to detail more gruesome and more tragic accounts of how in forklift truck accidents, drivers make attempts to escape from the cabin as it begins to topple. These reports recount a common tale, often in these attempted escapes to save their lives the driver commonly dies. Due to this Handling Equipment Online has provided some tips in order to help your workforce from having any forklift truck accidents. Lean in the opposite direction to the one in which the truck is tipping. Grip the steering wheel firmly, alternatively grab hold of the handles, this measure will dramatically improve the drivers chances of staying in their seat. Push down directly onto their feet, doing this pushes the driver back into their seat. In the unfortunate case of being involved in a forklift truck accident, if the driver keeps their nerve and remains in the cabin, securing themselves in place using the three above tips, the driver may be bruised. However there have been virtually no fatalities recorded for this type of accident. However it has been shown that no amount of training can prevent some drivers from attempting to jump free from the truck. Due to this the only safety precaution which seems to have been proven to be effective in this scenario is to wear a seatbelt. This entry was posted in Health & Safety and tagged forklift truck accident on January 16, 2014 by admin. Earlier this year Tactus Technologies developed the first video game like reality training program, specifically designed to help train a forklift truck driver. The company hopes that the product will help to reduce the number of injuries and deaths which stem from the misuse of forklift trucks. The simulation program, creatively named the 3D Forklift Trainer, allows a prospective forklift truck driver to practice from the safety of an armchair through video game like system. A depth has been added to the simulation through the inclusion of a steering wheel, joystick and pedals. The program tests prospective drivers in a variety of simulated environments which include railway tracks, elevators and warehouses. Jim Mayrose, the chief executive at Tactus explained that the simulator came into being due to a “need to improve operator readiness.” Figures from the Operating Safety and Health Administration (OSHA) revealed that improper forklift actions account for over 100 fatalities and a staggering 100,000 injuries each year. The Tactus co-founder and professor of mechanical and aerospace engineering at Buffalo University, Thenkurussi “Kesh” Kesavadas said “Until just recently, such virtual reality technology programs were only available to the military and university laboratories. 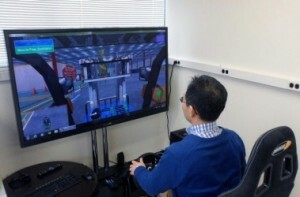 By pioneering the use of gaming technology and computers into our software, we are able to provide our 3D forklift simulator at a low and reasonable cost for safe industrial training.” Kesavadas is also the director of the Virtual Reality Lab at Buffalo University. The simulator was funded through a financial grant from the Operating Safety and Health Administration. Recent reports have consistently demonstrated that the simulator lessons conform to the stringent OSHA guidelines. The lesson plans included in the simulator require students to react to a range of safety challenges. These challenges include ramps, elevators and moving people, which are designed to reinforce the use of corrective measures for these future drivers. Each driver gains a personal profile which charts their progress whilst also evaluating their performance. Reports state that on average it takes an operator between three to four hours to complete the training program. “Companies which are using our product will find that they have shorter training circles with less supervision needed and, most importantly, a safer environment” Mayrose said. After the initial purchase, customers will receive a full licence for their forklift trainer software, a customised computer, in addition to a steering wheel and set of pedals. Optional features include a 60-inch screen and specialised forklift-type seating. A commercial version of the software is available which includes a standard warehouse environment. The software is fully customisable so that it can be adapted to match the environment of the company. This entry was posted in Health & Safety and tagged forklift truck driver on September 3, 2013 by admin. 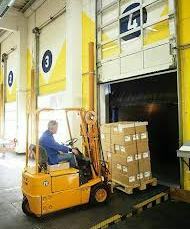 A recent study conducted by the Health and Safety Executive has indicated that most risk intensive aspect of industrial activities is the loading and unloading of goods. The report stated that an astounding 30% of all transport workplace accidents can be attributed to incidents occurring in this area. The impact on businesses can be detrimental resulting in millions of pounds worth of insurance payouts and sick pay. Due to this it is essential to provide all members of your workforce with adequate training to cover loading bay safety essentials prior to using them for this purpose. It may sound basic; however the impact of failing to do so could mean the downfall of your business, and your hard earned reputation. The immediate area which surrounds loading bays can be a thriving hub of activity, due to this it requires a specific safety plan. In order to be effective you need to ensure your workforce adheres to this safety plan. Lorries arrive, pallet trucks are loaded and unloaded, lorries leave, and trucks are loaded and then unloaded. With all of this activity the loading bay can quickly degenerate into a state of chaos. This is when accidents occur. To avoid this and ensure your loading bay safety is addressed, it is essential to implement the correct safety procedures, and to ensure that each member of your workforce knows and understands their specific role. However this is not as simple as it may initially seem, you have the added complication of drivers and staff members from external companies. These individuals may operate under a slightly different system, and may not be familiar with your company’s specific methods. Each new arrival potentially spells a new set of hazards and dangers for your workforce; to counter this, it is imperative that you ensure the safety of your workforce during these hectic periods. Educating members of your workforce about loading bay safety is the solution to this problem. Ensuring that each member of your work force is competent and able to quickly spot problems and potential accidents, and then handle them accordingly is indispensable. This applies to all members of your workforce, from dedicated loading bay workers to pump truck and pallet truck operators. The Health and Safety Executive has, in light of their report, provided a range of suggestions to help companies and businesses combat the risk. These measures include conducting additional risk assessments, evaluating the risk potential posed by visiting drivers and ensuring your entire workforce is equipped with sufficient knowledge and awareness, enabling them to stop work should an incident arise. Utilising these methods together is a guaranteed measure to ensure your loading bay is a safe environment. This entry was posted in Health & Safety and tagged loading bay safety on July 9, 2013 by admin. Many in the handling equipment industry are all too familiar with the recent death of a welder in a ship building company, who were fined in excess of £120,000 for their negligence. The incident happened as the ship building company left the keys in all their forklifts, enabling anyone to use them. The welder who had no forklift training, was then able to take one of the trucks and was unfortunately crushed between the vehicle and a crane lifting beam. Training: Ensure that all your employees who use forklifts are fully trained to use your equipment and are up to date on the latest health and safety procedures. When doing this it is important to bear in mind that every site or workplace is slightly different, so it may be worth introducing a bespoke health and safety procedure for each workplace. This will help to improve the health and safety of your workforce far more than standard or generic training courses. Seasonal Workers: If you make use of seasonal workers from time to time it is important to ensure that they have been given a comprehensive induction, are competent using your machinery and equipment and are familiar of your onsite health and safety procedures. Language Barriers: It is important to remember that some of your employees may be from different cultural backgrounds. Due to this your employees may not be completely fluent in English. It is important that you ensure that they are fully aware of the UK’s Health and Safety requirements, additional training may be required to meet these requirements. A top tip is to provide detailed coloured posters, which are easily visible informing your workforce on key health and safety requirements. 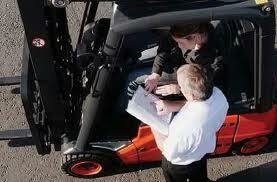 Technology: There is a vast range of equipment available to increase safety when using forklift trucks. Therefore it is worth doing research to see what equipment is available for your specific needs and requirements. Reporting: Encourage your employees to report any health and safety issues in the workplace. Ensure that you have an anonymous, easy to report procedure in place to help workers to report any accidents or hazards which may occur in the workplace. 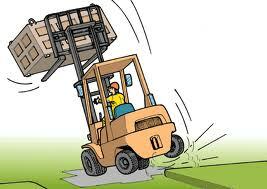 This entry was posted in Health & Safety and tagged forklift related accidents on July 2, 2013 by admin. One of the most frequent questions our technical team here at Handling Equipment Online get asked is whether their employees have to wear a safety harness when using our forklift platforms. 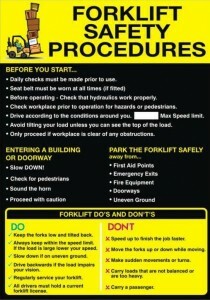 The question has arisen since OSHA has cracked down on employee safety when using forklift trucks. It was not so long ago when it was standard procedure to use a pallet attached to the forks of the truck as a work platform. Please note that OSHA legislation has made this practice illegal. However what seems to be an increasingly grey area in the OSHA legislation is whether workmen are legally required to wear a harness whilst using forklift work platforms. When looking over the OSHA legislation surrounding the safe legal use of forklift truck platforms, there appears no official legislation or mandate which requires employers to ensure their employees wear harnesses whilst using forklift platforms. What is interesting in the OSHA information is how the legislation is worded. The legislation reads that although OSHA currently has no official rule regarding the use of harnesses with employees using forklift truck platform. They have the power to enforce fines to employers who fail to ensure their employees wear harnesses on forklift platforms, and an accident occurs as a result of this negligence. Further research into the area has revealed that OSHA frequently does fine employers when these accidents occur. OSHA state they fine employers for their failure to harness employees in the case of forklift platform accidents under what they view to be both negligence and a failure of the duty of care on from the employer. This is because legally, whenever there is a perceived risk or danger in the workplace it is the employer’s responsibility to ensure that all foreseeable harm is avoided. In this case that means ensuring the employee is wearing a harness when operating and using forklift platforms. 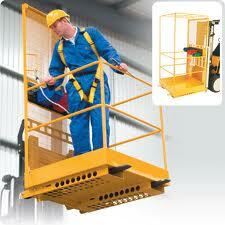 Currently there is not official legislation or mandate from OSHA regarding the use of harnesses on forklift platforms. However if there is an injury or death in your workforce which could have been prevented by the use of a harness on a forklift platform then you will likely receive a large fine. Due to this at Tiger we would always advise our clients to ensure their employees make use of harnesses when using our forklift platforms. For more information regarding either our forklift platforms please do not hesitate to contact our technical team on 01384 895859. This entry was posted in Health & Safety and tagged forklift platforms on May 15, 2013 by admin. When introducing new drum handling equipment into your workforce, especially if your workforce is inexperienced with using this form of handling equipment, you may require planning or training. This is due to two reasons; firstly, some drum handling equipment is only designed or certified for use with sealed drums or containers, and secondly, your workforce may be unfamiliar or inexperienced with handling and moving hazardous materials. Your recent drum handling purchases may require developing a contingency for unplanned mishaps including spills and leaks, accidental drum drops due to operational errors and malfunction avoidance techniques. All products purchased from Handling Equipment Online come with a one year product warranty on all parts, ensuring that you should experience minimal operational malfunctions within that period. However when introducing drum handling equipment, a lot of planning is required surrounding the introduction. It is imperative that you do not leave this to the last minute as this can both delay the use of the machinery within your workforce and encourage accidents and mistakes from negligence due to being unprepared. Before using handling equipment ensure you have fully prepared your maintenance schedules and risk management strategies. Ensuring that all of your work force is fully trained in the use and implementation of drum handling equipment should be conducted prior to an accident or malfunction and not in reaction to one. When introducing drum handling equipment into your workforce it is essential that you are fully prepared from a health and safety perspective. Simply put this means making sure your first aid provision incorporates the kind of risks and accidents which can arise from the use of drum handling equipment. Using transportation drums can entail potential leakage from the drums. This can be due to factories defects in the drum, damage caused to the drum prior to it being received by your workforce, an accidental drop, and spillage or tipping. Due to the hazardous nature of a lot of drum contents it is essential that your first aid stations are fully equipped with eye wash. A further safety procedure we advise all of our clients to employ when using drum handling equipment is to ensure that their workforce wear eye protection when using drum handlers especially with hazardous contents. It is far better to be prepared and take the necessary safety procedures than face legal prosecution for negligence. The expense incurred from implanting and introducing these measures to your workforce now will more than cover the potential expenses for compensation. 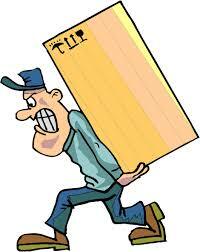 This entry was posted in Health & Safety and tagged drum handling equipment on May 9, 2013 by admin.